Not quite, but close; we need to reexamine how we inform the public about economic decisions so they can make rational decisions instead of letting the oligarchs control well over ninety percent of the information or propaganda we use to make decisions. Efforts to expose scams are reported only where a few can see it while multinational corporations control reward those that deceive more than those that do productive work helping consumers. Scams should be exposed. 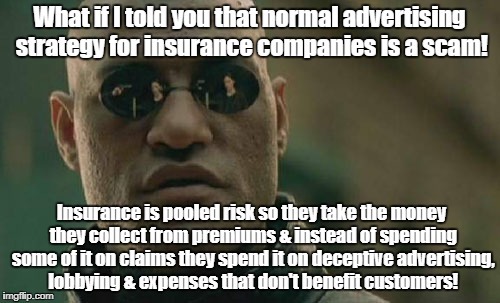 But what your meme described sounds more like normal advertising strategy than a scam. If you Google many of these ads, including Colonial Penn, you can often find consumer advocates exposing them for what they are but that is buried where few see it, while the propaganda paid for with money from premiums is everywhere! 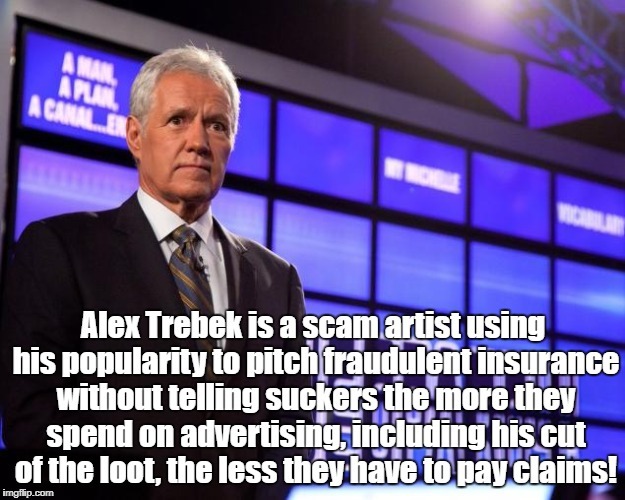 Alex Trebek is a scam artist using his popularity to pitch fraudulent insurance without telling suckers the more they spend on advertising, including his cut of the loot, the less they have to pay claims!